While wheel chocks might not be the most glamorous or hi-tech product you’ll ever buy, they do have a very important purpose, which is to stop your vehicle or trailer moving from its location. The YM W4194 Solid Rubber Wheel Chock does this as well as any RV wheel chocks available and here is why. They are made from strong and very durable rubber and are ideal for use with lightweight and heavy-duty RVs such as trailers, caravans and motorhomes, although they can be used on other vehicles such as cars or vans and they can also be used to chock boat trailers. 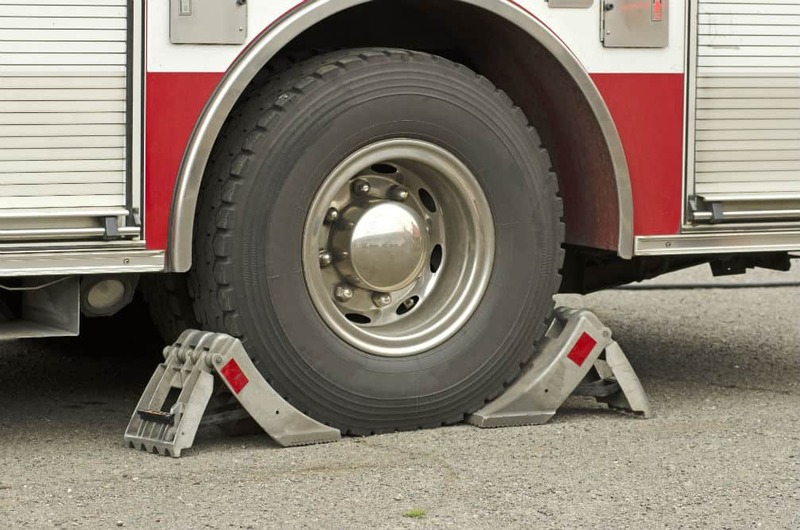 The base has very pronounced surface which provides a non-slip grip underneath whenever these RV chocks are in use. In terms of their size, the dimensions of each chock are 8.75 inches in length, 4 inches wide and 6 inches in height, so they should be suitable to be used as wheel chocks for most standard tire types. They weigh just over 8 lbs. so they are not that heavy if you are lifting them plus they each have a handle molded into their shape which makes carrying them very easy. If you are looking for wheel chocks for your RV or a trailer that are not going to cost you a fortune then you should consider these Camco Wheel Chocks. Costing less than $12 for a pair, they are the best budget RV wheel chocks we have seen. 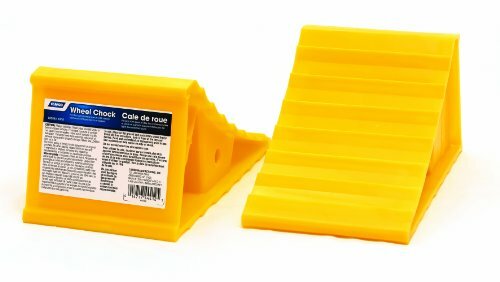 You won’t miss these RV chocks, given their bright canary yellow color, and they are likely to stay that color as they have been coated with UV inhibitors which prevent them from bleaching due to bright sunlight. 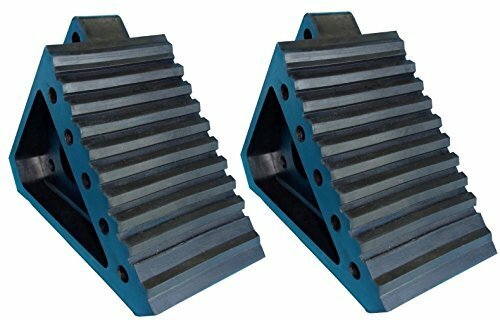 The wheel chocks come as a pair and are made from a durable plastic material. As they weigh only 1.5 pounds they should be easy to carry. The dimensions come in at 8.4 inches x 6 inches x 5.1 inches, and at this size should be suitable for tires up to 26 inches wide. This means you can use them for larger RVs and trailers as well as standard sized vehicles such as cars and vans. One last point we must mention is that they are made in the US which can be rare for this sort of product. If your RV or trailer is larger and not suited to some the more lightweight chocks available, then you will need to purchase ones which are larger and more robust. For us, the best for that job are the YM W4149 Heavy Duty Wheel Chocks. First things first, and that is the dimensions which are 11 inches long by 11 inches wide, and 8 inches in height. From these figures, you can see right away that the size of this chock is going to be more than sufficient for larger vehicles and trailers. The construction is also geared towards heavier RVs, with a steel body which gives it a solid, and strong base. 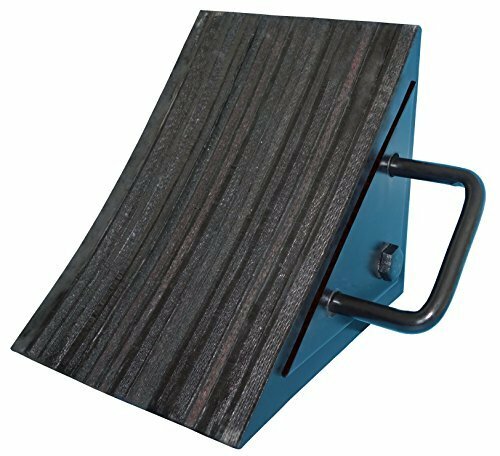 The base of the chock has reinforced rubber on its surface which provides a sound grip underneath to prevent any slippage. Where the tires come to rest against the chock there is a curved and contoured surface to provide additional grip. As you’d expect, this chock does weigh more than most of the others at almost 11 lbs., however, it does have a metal handle which makes carrying it easier. Where you have an RV or another vehicle with dual axles, a more cost-effective and practical solution than standard chocks are X-chocks. These can be set between two wheels to ensure that they do not move and that your vehicle is stable at all times, even when you are moving about inside. The best X-chocks we have found are the BAL Products Group X-Chocks and they are the best for several reasons. Firstly, they are designed to stabilize your vehicle perfectly by using the opposing forces on each of the two tires. Next, it has a large range of sizes that it can be used with, and can extend up to 10 inches if needed. Although they are made from steel, any danger of them rusting is taken care of thanks to a rust-prevention coating that the X-chock has across its entire surface. Setting up the X-chock is extremely simple. 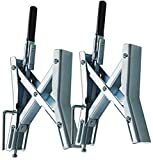 All you need to do is hold it between the two tires of your trailer and then turn the adjusting screw until the bases of the four arms are secure against the tire walls. There’s a handy ratchet wrench supplied with the X-chock to make this even easier. Whereas X-chocks may be the best option for tandem tires, they can often come with a high price ticket. Thankfully, there are X-chocks which have prices which should be within everyone’s budget. The best budget X-chocks available are the OxGord Universal Locking Wheel Chocks, which come as a pair and normally cost less than $30. They are ideal for securing dual axle trailers and caravans which have a gap between tires of up to 8.5 inches. These X-chocks are lightweight but at the same time have more than enough strength and durability to fulfil their function of keeping tires stable. 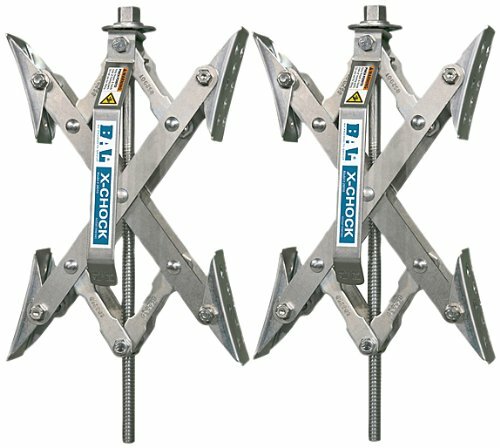 To use the X-chocks you simply use the built-in ratchet which turns the thread which then opens out the four arms of the product. The ratchet has a cover on its handle for comfort. 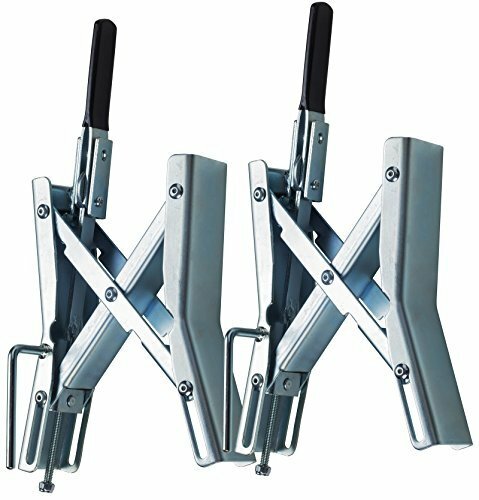 When the X-chock is in place there is also a locking feature to prevent them being removed, which adds a level of security to their use as well. The main benefit of RV chocks is that they minimize the movement of the vehicle whilst it is stationary you are inside. They can stop the RV from rocking from side to side or back and forth both of which can be disconcerting whilst inside. They also play a role in allowing absorption refrigerators to operate properly, as they can malfunction if the vehicle is not level. There are some technical elements to consider such as the tire width, and if you have a double axel, the gap between the tires. Check this specification especially if you plan to use X-chocks. The overall dimensions need to be checked to see if they are compatible with the weight of your vehicle and the tire widths. Other considerations will include the ground conditions and if the chocks are suited to the ground type where you plan to park the vehicle. The type of grip and the material used for this will also be a factor to consider in relation to the ground conditions.